Slavin Earns Fourth Book Award for "One Million In the Bank"
"We had a huge response to our annual awards program with many excellent books vying for top places. Your title rose to the top, and you should be justifiably proud." -- Feathered Quill representative to author L.F. Slavin in an award letter. 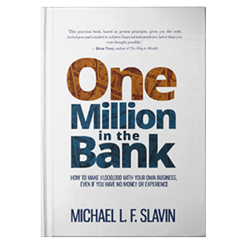 Michael L.F. Slavin's acclaimed "One Million in the Bank" is now the recipient of four book awards in total, including first place (Gold Medal) in The Feathered Quill's 2016 Informational Book Category and third place (Bronze Medal) in the Feathered Quill's 2016 Self-Help Category. Last year, "One Million in the Bank" won first place in the "Best Business and Entrepreneur" book category from Nonfiction Book Awards, as well as first place for the "Best Financial" book from the same organization. "One Million in the Bank" describes how ordinary people can become millionaires by opening tried-and-true business concepts within their own cities. In addition to providing concrete guidance on how to accomplish these tasks, Slavin shares real stories of people who used his formula to succeed, from a barely literate gardener who now owns a successful nursery worth about $14 million to a stressed-out office worker who put $1 million in the bank by launching a roofing business. While "One Million in the Bank" may be labeled a self-help book, it doesn't give the kind of advice readers have come to expect from this genre. The advice in the book revolves less around the power of positive thinking and more around the the power of doing—identifying opportunities and taking action. In a formal letter to Slavin, a spokesperson for The Feathered Quill said: "We had a huge response to our annual awards program with many excellent books vying for top places. Your title rose to the top, and you should be justifiably proud." Slavin is a successful entrepreneur in his own right, and has used the techniques outlined in his book several times to launch successful businesses. But he wasn't always an author and entrepreneur. He was once just trying to get by, just like so many Americans. He faced eviction, repossession, and bankruptcy before he unlocked his formula. This has led to his conviction, oft-repeated in the book, that truly anyone can become financially successful. Learn more about "One Million in the Bank" by visiting http://www.onemillioninthebank.com. Veteran, father, and entrepreneur Michael L.F. Slavin knows the value of hard work and perseverance. He also knows what it's like to struggle. After facing enormous financial challenges, he started his own business and became a millionaire in a matter of just three years. Now, Slavin is passionate about teaching others to do the same through his book and lecture series. He wants people to understand they don't have to create the next Google or Facebook to become financially successful—they can do it by starting time-honored businesses like the ones they see and interact with every single day. Slavin is available for speaking engagements.